Oracle GoldenGate enables the exchange and manipulation of data at the transaction level among multiple, heterogeneous platforms. 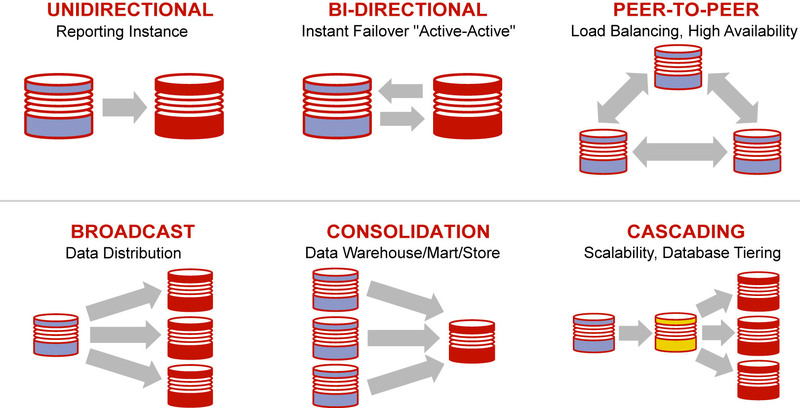 Oracle GoldenGate Architecture allows to replicate selected data, transactional changes, and changes to DDL. It supports various business requirements like High Availability, Initial Load and Database Migration etc. In simple terms, Extract process on source captures the transactions happening on source database and writes them to a trail file . The datapump process ships those trail files to the target host/db server with help of collector. Then the replicat process on target db server, reads those trail files and apply the transactions on target database. Initial load: Extract captures the data directly from their source objects. Extract captures the data directly from their source objects. Change Synchronization: Extract captures DML and DDL operations after the initial synchronization has taken place. Extract captures DML and DDL operations after the initial synchronization has taken place. The data source for the Extract process can be Source Tables (Initial Load), database recovery logs or transaction logs. When configured for change synchronization, Extract captures the DML and DDL operations that are performed on objects in the Extract configuration. Extract stores these operations until it receives commit records or rollbacks for the transactions that contain them. When a rollback is received, Extract discards the operations for that transaction. When a commit is received, Extract persists the transaction to disk in a series of files called a trail, where it is queued for propagation to the target system. All of the operations in each transaction are written to the trail as a sequentially organized transaction unit. This design ensures both speed and data integrity. It is secondary extract group in the GoldenGate configuration. With Data Pump configured the Primary Extract writes the captured information to a trail file on source system, Data Pump reads this trail and sends the information to remote trail file on the target over the network. Replicat process on the target system reads the trail file and then reconstructs the DML and DDL operations and applies them to the database. Oracle GoldenGate stores the captured changes temporarily on the disk in a series of files called Trails. On Local system it is called as extract trail or local trail. On Remote system it is known as remote trail. Data Pump process reads the local trail on the source system and Replicat process reads the remote trail and applies the changes to the target database. Trail files are created using “ADD EXTTRAIL” and “ADD RMTTRAIL” command. Manager is the control process of GoldenGate. This must be running before Extract or Replicat is started. Collector is a process that runs in the background on the target system when continuous, online change synchronization is active. Manager starts the Collector process automatically. Upon a connection request from a remote Extract to Manager, scan and bind to an available port and then send the port number to Manager for assignment to the requesting Extract process. Receives the captured changes sent by the Extract and writes them to the remote trail. The collector can receive only from one Extract i.e. only one collector process for each Extract. Groups are defined to differentiate between multiple Extract or Replicat processes. Group consists of process (Extract or Replicat), its parameter file, its checkpoint file and other files associated with it. For Replicat, a group may be associated with the checkpoint table. Groups are defined using “ADD EXTARCT” and “ADD REPLICAT” commands in Oracle GGSCI. Explanation is very clear,Expecting some more posts on golden gate topic.Thanks for sharing. We will try to post more useful posts on goldengate implementation.